And now walking the runway is mini-male-model, Braydon. Braydon joins us fresh from his sick bed where the poor little guy had pneumonia. He's feeling better and getting his spunky self back again, but he's not 100% yet. 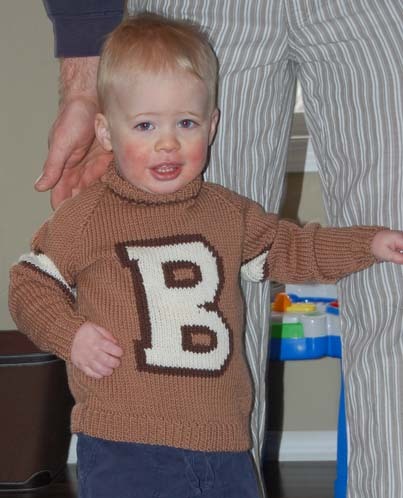 He's modeling the "B" sweater that I made for him recently. I'm hoping that it will keep him warm and cozy. It's a bit big for him right now, which is just what I'd planned. By the time the cooler fall weather rolls around, it should be a good fit. I plan to get back to his blue cable sweater on the weekend. I'm afraid that the excitement of two very colorful projects, the Sock Yarn Afghan (42 small blocks + 1 large finished) and the Triangle Squares Cushion (now working on row 6 of the blocks), distracted me for a short while. I'll continue to work on those, as well as a pair of socks, but in more equal shares, going forward. Click on the picture to read the label. Use your Back button to return here. By the way, I finished off Braydon's sweater by adding a little label. The color of the sweater is not accurate in this photo. The correct color is in the first picture. Coming up.... a new shop (since last October) in Denver, new yarn, new project, new temptation and a knitting dilemma. I hope to see you back here soon.